Which Political Scientist is Managing Khadim Hussain Rizvi's Twitter? Home News Which Political Scientist is Managing Khadim Hussain Rizvi’s Twitter? Winter is coming and so the protests in Pakistan. TLP (Tehreek-e-Labbaik Pakistan) lead by the religious cleric Khadim Hussain Rizvi has brought Pakistan down to its knees for the second consecutive year in the name of religion. While, people are worried how a cleric from a Lahore based mosque could get such prominence they are also scratching their head over who is managing his so dynamic Twitter account. Folks are actually asking this question which is no less than an enigma. Tweets which are in English seem to come from a person who is well versed in the terminologies used by political scientists. The words like ‘imperialist, ‘capitalist and ‘secularist are being used to make a political case against the Supreme Court’s judgement. Had Asia been punished under 295 C, the islamophobes and neo-imperialists would have been silenced once for all. Unfortunately government has not shown courage to displease secular-capitalist nexus. Viewers couldn’t resist Rizvi’s appreciating Khadim Rizvi choice for admin for English tweets and they praised him in his language. Molbi tu angrezi aala banda changa lab laya ae. While this tweet blames the government for a Supreme Court’s verdict on a blasphemy accused in a political language it fails to come up with a satiable logic for its claim of silencing Islamophobia. Hanging someone merely on the basis of accusations is something that can provoke the sentiments against religion among humanists, it can’t do anything to end or even to abate the rampant Islamophobia in Europe and America. Pakistanis reacted to the supreme court’s verdict of Aasia Bibi case via Twitter. In fact, a major number of social media users welcomed the acquittal of Aasia Bibi who was falsely accused of blasphemy. It seems that Khadim Hussain Rizvi, TLP head who is leading the countrywide protests against Supreme Court’s verdict is well aware with the need of the hour that most of his critics are on Twitter and he needs to respond to them in their language. And few tweets are even telling that miscreants have nothing to do with TLP which is, according to the following statement, peacefully protesting against the Supreme Court’s verdict. TLP has no connection with the miscreants, trying to disrupt peace. We're a peaceful organization and determined to continue peaceful struggle. It is to be noted that many of the protesters have blocked the main routes to megacities, burnt down vehicles and brought life to a halt in Pakistan. And, still, this account is trying to tell that TLP protest is peaceful and they are no miscreants. And, Twitter users also calling out others to report Rizvi’s account in order to get him banned from social media. It is a fact that social media is a hotbed of fake news, but at the same times, it gives everyone an opportunity to propagate their narrative, without any regards to its harmful impacts on society. In a situation when peace is the need of the hour, people must come forward to stand against those who try to create disruption through provocations. So, few of tweets from his account have been reportedly deleted or removed. According to this Twitter user, the social media has removed his Twitter threats which were in English as well as Urdu. Actually, Twitter has removed Khadim Rizvi’s threat tweets in both Urdu and English. Yesterday, it had removed few of his videos as well. 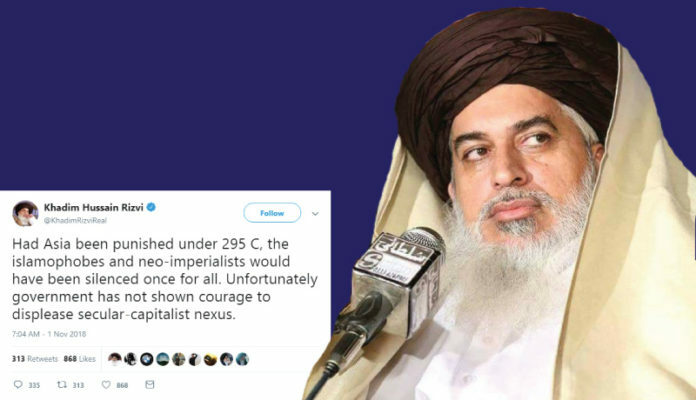 Khadim Hussain Rizvi who was merely a cleric in a mosque became a ‘religious scholar’ capable of influencing the mobs. How come it was possible. Was it due to his flamboyant speeches or his carefully crafted tweets. Whatever the reason is, or irrespective of whoever is backing him, which might be a possibility, there is a need to promote rational thinking in society particularly through educational institutes, so that no miscreant can easily betray the people and exploit their sentiments for their political goals.